After the cable debacle on Tuesday I spent the rest of the afternoon alternating between reknitting the cable band and fiddling around on the computer. That one mistake seemed to set the tone for the day because despite being careful I managed to miscross several more cables, which required more ripping back and reknitting (thankfully no more than a few rows at a time). Gradually the pile of spaghetti disappeared and by suppertime I had regained my nine pattern repeats. My goal was to complete ten repeats by the time I went to bed, just so I could feel as though I had accomplished something. I had to go out that evening but when I got home I was determined to knit the final pattern repeat, even though it meant staying up a bit later than I usually do when I have work the next day. Yesterday I took a little break from the cable band, knitting only two pattern repeats. 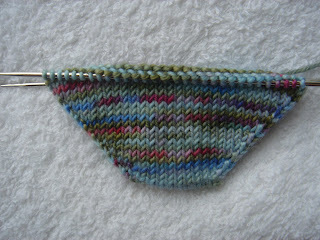 I felt a bit lost without any socks on the needles so last night I reached for my "Monet" and cast on. I almost always knit socks from the top down with a heel flap but this time I decided to go toe-up, since I'm not sure how far the yarn will go (Colinette Jitterbug has less yardage than most sock yarns). I've had enough of guessing games lately, what with Auburn Mist and Craig's slippers (I had only about 2m left of the purple by the time I finished the pair). Since I always struggle with the Figure-8 Cast-on I decided to try out the Magic Cast-On and once I caught on found it much easier. But I soon remembered one of the reasons I don't like toe-up socks--the seemingly endless, fiddly M1 toe increases. I'm not sure why it takes so much longer to go from 20 to 60 stitches than it does to go from 64 to 16. 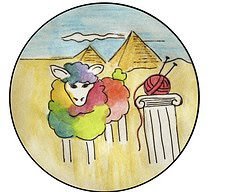 I gave a lot of thought to what I wanted to do with this yarn. My first instinct was to just knit a plain sock and allow the yarn to speak for itself. As you can see, the colours are really lovely and they don't pool or flash. Then I thought perhaps I should add a little something, maybe a simple lace pattern or a cable up each side. I dug out all my sock books and magazines and looked through them but couldn't find exactly what I was looking for. In the end I decided to knit a plain foot, then do a simple 1x1 rib for the leg. Maybe I'll finish them with a fancy bind-off, like a picot edge. 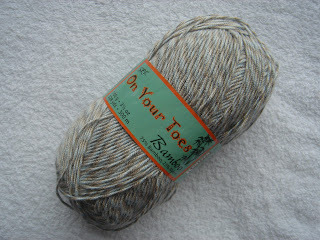 Yesterday I also made my first yarn purchase of 2008, SRK On Your Toes Bamboo in a beige, blue, and white twist. I don't consider this cheating on my yarn diet because a) I didn't have anything appropriate in my stash and b) it is not for me. When my mother-in-law was here she expressed an interest in owning a pair of handknit socks, so I am going to make her some for her birthday in April. I didn't think she would appreciate self-striping yarn in crazy colours and I wasn't willing to part with any of the hand-dyes I'd chosen especially for myself. We've just received this yarn in at work and I thought she'd like the softness of it (she was a bit worried about wool) and I thought the subtle colourway would lend itself well to a pretty lace pattern. I am leaning towards Cat Bordhi's "Flow Motion Socks" in VK Fall 2006 (go here for corrections). Once again, I've chosen a toe-up pattern, this time to ensure that I have enough yarn to fit my mother-in-law's long, narrow foot. Today we woke up to more snow, which quickly gave way to rain. The grey skies and slushy streets provide a perfect excuse for staying home and knitting. Plans today include continuing on the cable band, knitting a bit on the Monet socks, and maybe casting on the M-I-L socks. 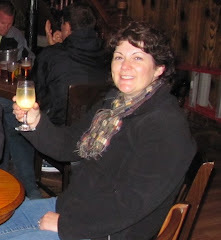 And I promise to lay off the wine.